I love hosting people! It brings me so much joy to be surrounded by people I love. I think it is because we grew up living near family and every week there was some type of “event.” It could be as simple as going to a siblings football game or a family member’s birthday dinner or extravagant as having a bunch of people over from church for a gathering. Over the years I think I have grown wiser in hosting events. I’ve found a way that works for me to minimize some of the stress that can come when hosting events. This summer we had a couple family weddings and I offered to have bridal showers at my house. I was so excited to be able to host, but I knew I needed to simplify a bit. We were going through an exterior home renovation, my husband had been non stop traveling for work, and the kids fall schedules had me in the car from sun up to sun down. To make my life easier and to get an idea of how many people would be coming, I found the cutest invites on Paperless Post & sent them out. They have invites for every occasion and every style. The style of the Rifle Paper Co invites have me swooning. 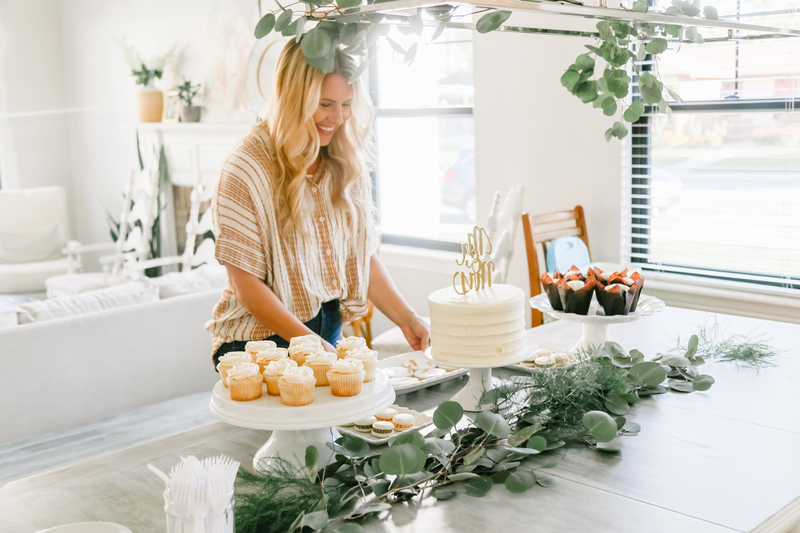 I have used Paperless Post for so many showers and invites because it is so helpful for me to see how many people are coming, how many people have seen the invite, and to send out a reminder. When you are planning for food and activities, making it easy for people to RSVP also makes it easy for you to prep. Not to mention, it saves money & time on printing, addressing, and mailing. Lucky for me, the girl marrying my brother was super easy when I asked her what she wanted for her bridal shower, She told me she’d be happy with anything and to do whatever worked for me. We were all wearing white & cream for the wedding with the guys in gray so I decided to stick with a white bridal shower with some fresh greenery. I found this darling package of bridal shower games! I’m usually not one for games, but this package was so cute with so many options & it’s less than $12! Hands down, the best piece of advice I can give, is hire out things you don’t specialize in. If you are just dying for cake pops, but you’ve never made them, and you don’t have weeks before to try them out, don’t do it. This was such a struggle for me! 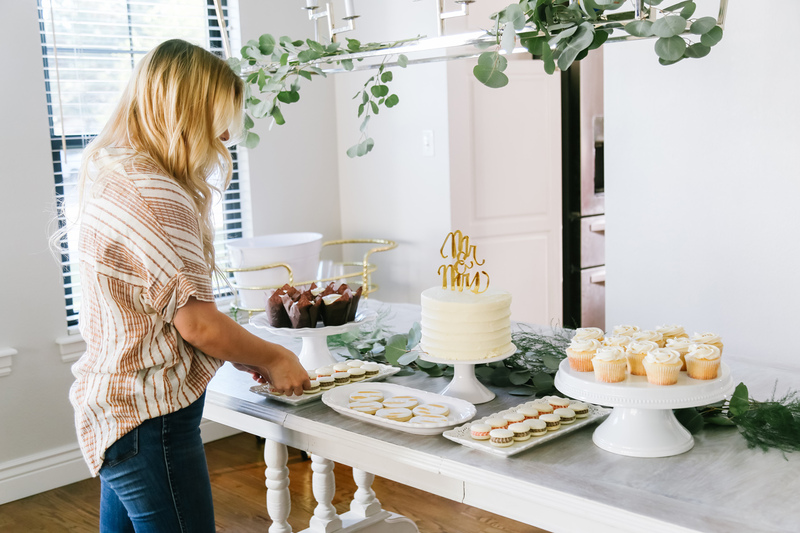 I’d find cute desserts & decor ideas for my kids parties. I’d then spend weeks and countless hours trying to master something new. I’d be exhausted, stressed, and my kitchen would be a mess while people were showing up. I attribute it to the amount of kids I had and where we were. If I had 2 kids and they both napped or 1 was in preschool, no problem. I would make myself find time. With 4 kids where they are right now, I’ve thrown that hope out the window. I found Cake Party Co on Instagram & have now placed a few orders through her. Macarons, monogram sugar cookies, and cupcakes were made by her. Thank heavens for hashtag searching! These desserts were all so yummy! I grabbed the cinnamon rolls & cake from a local bakery. 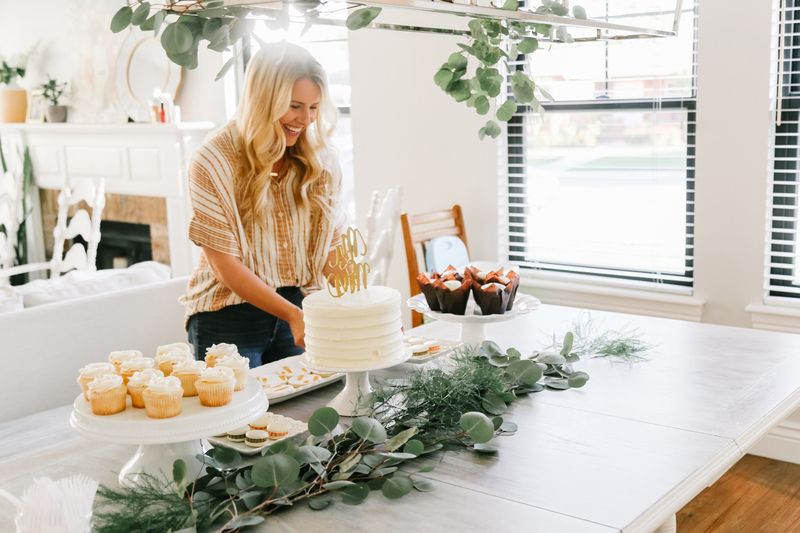 The cake topper came from a local party store, but check here for a ton of cute options to host your own white bridal shower! 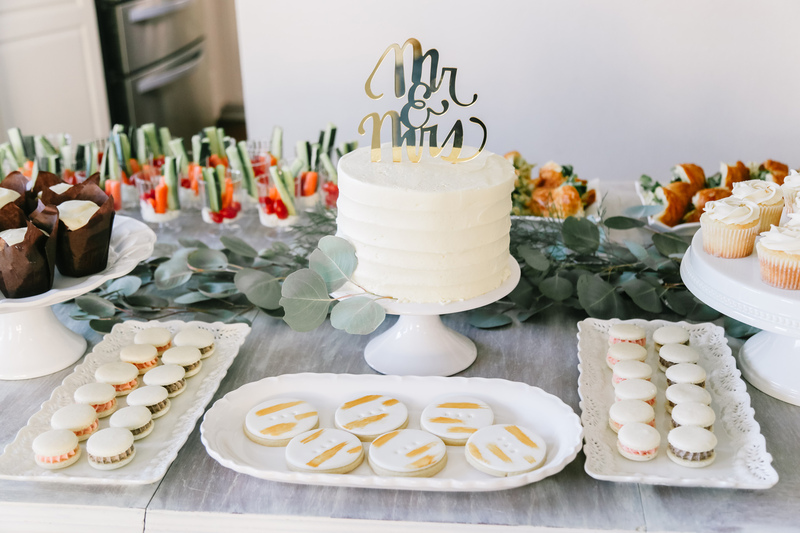 Give yourself time to set your white bridal shower up. I like to pick up the desserts the day before and if that doesn’t work I shoot for 8 hours before the party starts. Keep everything in the fridge or on a counter before you start setting up, if you have little hands like I do. I grabbed Eucalyptus from a darling local florist. It lasts for awhile & you can get a huge bunch for less than $15. Another tip would be to check your local Goodwill, TJ Maxx, Target, & Home Goods for platters & cake stands. 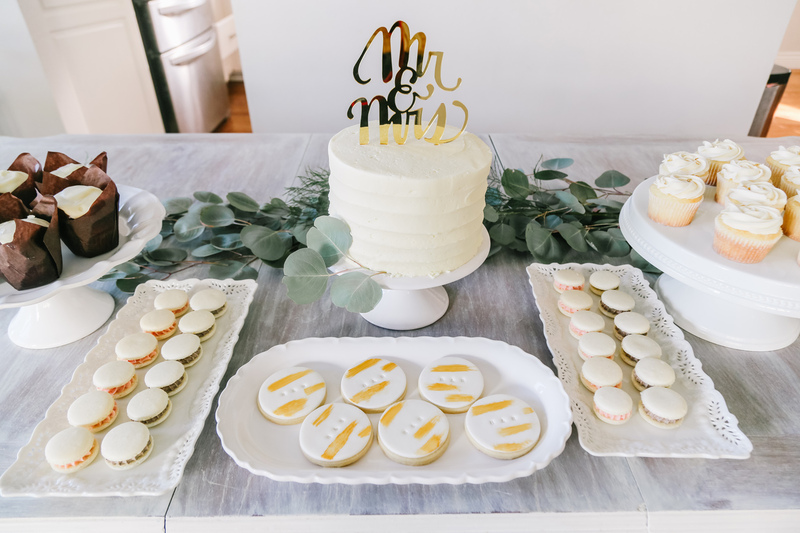 I have splurged on a couple timeless cake stands (here & here are my 2 favorites), but most of mine have been from the above stores for $15 or less! We served a light dinner of veggie & Ranch cups with Basil Pesto Chicken Croissants. 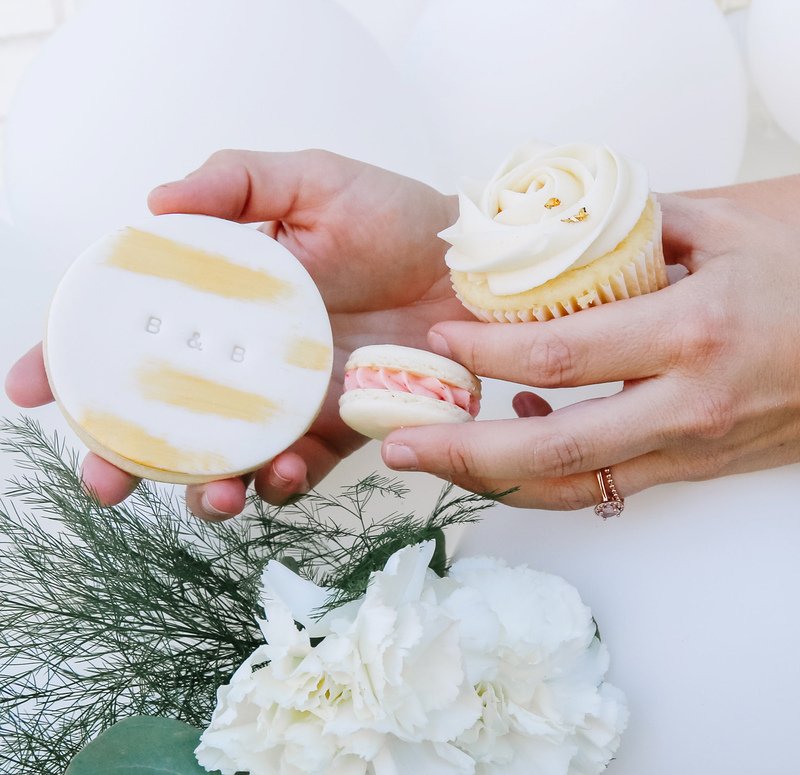 Can you believe how cute these darling desserts are? My favorite is that they taste as amazing as they look. If you are in Utah, definitely look up Cake Party Co. Remember that part where I said, hire out? Also, use your connections or beg your friends! I have an amazing friend who also happens to live a few doors down & she is so talented in the craft, making beautiful things niche. She made this gorgeous white balloon arch and we stuck some of our greenery in it. 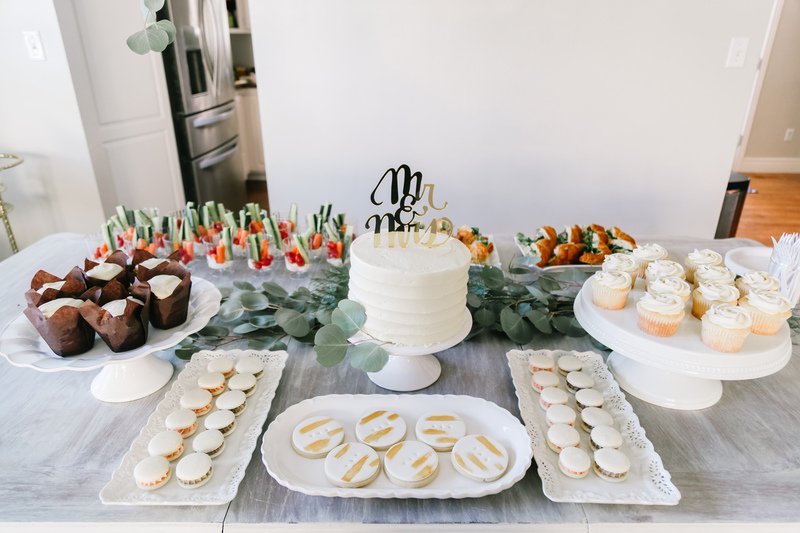 It turned out to be the perfect statement piece to welcome people to our white bridal shower. PS To say welcome to new readers and thank you to readers who have popped in from time to time, make sure you enter the giveaway below!